A Brighton student has won this year’s £10,000 Hix Award for her work exploring the human cost of the refugee crisis. 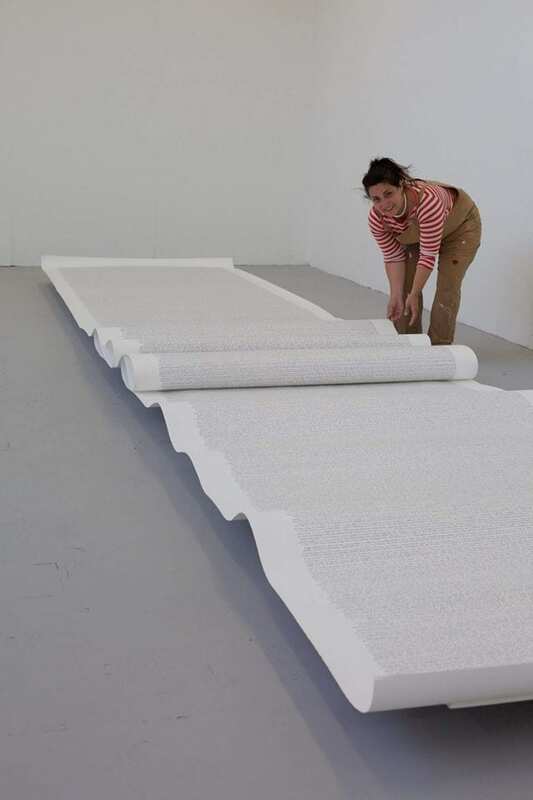 Elizabeth Eade, studying MA Fine Art, created Die Liste, a 10m-long hand written list documenting the deaths of 33,305 people who died accessing Europe. Elizabeth said: “I felt the need to make it when I found a list of people who had died, published in a German newspaper. I was quite overwhelmed. It was such an emotional thing to see this Excel spreadsheet, with abbreviations and in many cases no names – just n/n. “The list is compiled by an organisation called United who collated it from over 500 organisations around the globe. The scale of the tragedy is so vast, and my work was to highlight the impossible task of comprehending its scale. This is contrasted with the individual stories. Each line is a story of hope and adventure and ultimately tragedy, of very human endeavour, of brothers and sister and mothers and children. The judging panel this year included Tracey Emin, Gavin Turk, Stephen Webster, Dylan Jones, and Mark Hix – and the award was designed by Damien Hurst. Elizabeth said of her studies at the University of Brighton: “It has been an extraordinary course. I had taken some time after my BA to return to education, and I think this was partly as I didn’t understand what a different experience I would have studying a research degree. Elizabeth, who lives and works in Brighton, graduates next year. She will put the £10,000 award towards her studio costs and a solo exhibition at HIX ART in London in 2019. The Die liste will be on display in Coutts bank on the Strand from January until March 2019. This entry was posted in Fine Art, Postgraduate and tagged Dylan Jones, Elizabeth Eade, Gavin Turk, HIX ART, Mark Hix, Stephen Webster, Tracey Emin. I saw your work at the university and it instantly struck me as amazing and moving on several levels. Congratulations.